It’s for you, it’s alive — read it! The Bible is not a battlefield but the pathway into life. It is important that we never look at the Bible simply as a book to be attacked or defended. For this reason, the last book in the series is entitled Enjoy your Bible! The best way to read our Bible, how to understand it with sound common sense, and how we can read it in its historical context will encourage us to spend more time with God and his word each day. 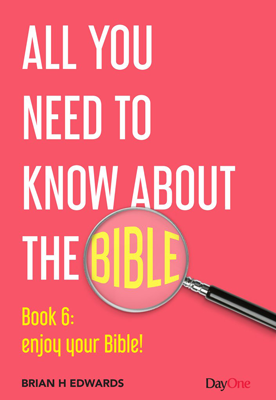 The inevitable conclusion in Book 6 is that we should read the Bible regularly. Among the various methods of Bible reading suggested, there is nothing better than reading the whole Bible frequently, so that year-on-year we are reminded of the great and small events, all of which contribute to the unfolding plan of salvation, which is revealed more and more clearly, as the Bible steadily points towards the coming of the Lord Jesus Christ and his return at the end of the age. To read the Bible for all its worth requires more than simply the ability to read. We must read with understanding and be careful not to misuse God’s revelation. ‘Hermeneutics’ is the technical word for how we understand and interpret the words of Scripture. Like any piece of literature, there are rules to govern our interpretation. They are not difficult to grasp, but they are essential to apply. 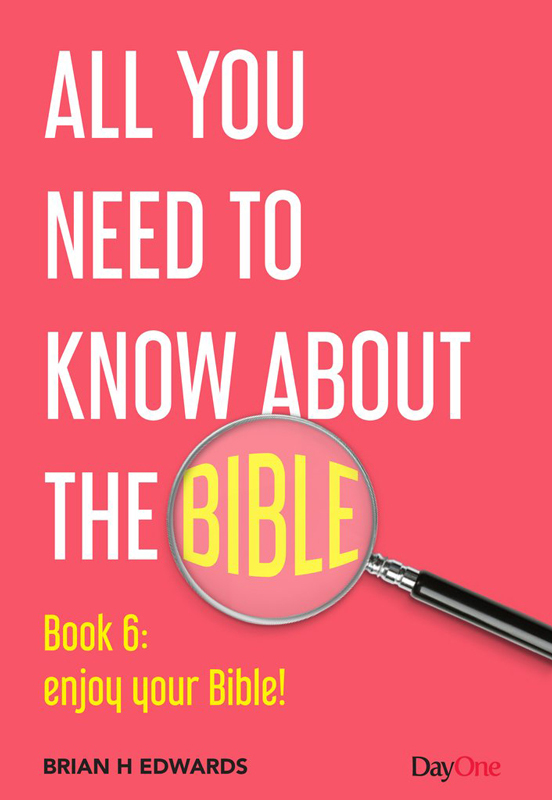 Two chapters in Book 6 will help us to read the Bible with common sense and good understanding. Some of the obvious dangers and pitfalls are outlined so that we will never claim, ‘God’s word says…’ When in fact it says nothing of the kind. 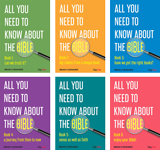 In this final book, a number of charts help us to get to grips with the narrative of the Bible. One lists the Old Testament books in their chronological order so that we can see how the prophets fit in to the history. Another pieces together the Gospel records of the life of Christ, and another outlines the Acts of the Apostles and where the letters of Paul, Peter, James, Jude and John fit in. Then, for those who would like to read through the entire Bible once in eighteen months, and significant parts of it twice, a chronological daily reading plan is offered. Brief notes show where each book fits into the unfolding story. The ultimate purpose in reading the Bible is to draw us closer to God and fashion us more into the likeness of Jesus Christ, therefore the closing chapter of the whole series is entitled: ‘Take time with God’. This suggests how we may plan our personal daily worship. By whatever name it is known, the daily ‘time with God’ has been lost in the busyness of the twenty-first century. In many Christian homes, husbands and wives do not pray together and children rarely hear their Christian parents pray. If prayers are offered, it is only occasionally and with as little time as we can spare. The rush of modern life is only one reason for the loss of what used to be an essential feature for every Christian home. We have lost an appetite for prayer because it is no longer seen as the privilege it really is: when a forgiven sinner can approach boldly the immediate presence of the Sovereign God of the universe and call him ‘Father’. His ever-listening ear is always open for the voice of his children. The Psalmist affirmed, ‘O you who hear prayer, to you all men will come’ (Psalm 65:2) and to this the Father responds, ‘You will call upon me and come and pray to me, and I will listen to you (Jeremiah 29:12). This ‘access to the Father’ (Ephesians 2:18) is the greatest privilege of the Christian life. Our time with God and his word is intended to be an enjoyable privilege. Let’s make it so.